One of the best ways to revitalize your living space is to work on the upholstery. With a dedicated upholstery staple gun, you can repair an old couch or affix new upholstery with relative ease. Finding the best stapler for this process is crucial so that you won’t have to struggle or hammer your staples into place. In this guide, we are going to review some of the top 10 best staple guns for upholstery. Additionally, we are going to provide a guide so that you know exactly what to look for in one of these devices. Before we get started on our 10 entries, let’s take a look at a comparison table of the staplers. Our first staple gun is also our first pneumatic. The Porter-Cable US58 is designed to provide a lot of power so that you can embed your staples with a single trigger-pull. It even has a nose extension for hard-to-reach places. The best feature of the US58 is its consistent power. The device simply will power your staplers into harder materials with relative consistency. Also, this is a lightweight option for upholstery stapling that will be easy to truck around. Additional purchases are the biggest issues with pneumatic staplers like the US58. Simply put, you’ll need an air compressor and pneumatic oil so that the tool runs right. Additionally, the nose extension could be longer. If you’re looking for power for a relatively low cost, then the US58 is a great option for someone who wants to have a simple reupholstering experience. Jams are easy to clear. This is a very durable stapler. It has a built-in nose extension. The nose extension could be longer. There is no safety button. Sometimes, you need a light duty item for upholstery stapling. When you need to repair upholstery, this TR45K is very effective; you’ll just have to apply some physical force since it is a manual product. This product comes with 1,000 staples and a case for carrying it. In addition to this, you can quickly unjam this stapler through the quick-jam-clear mechanism. As a chrome-plated stapler, this is a device that very attractive and has a good level of convenience. Don’t expect a lot of stapling power from this device. It’s actually designed for light duty, so if you need to staple lighter woods like poplar, then this is a good choice. If you don’t apply significant pressure with both arms, the device will have a hard time penetrating. For the every day, around the house jobs, the TR45K is a good option. While you shouldn’t do high-level upholstery work with it, it’ll work fine for upholstery repair and light replacement. 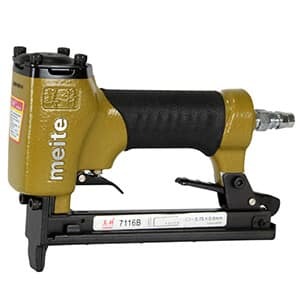 This is a durable upholstery stapler. It has a handle lock for safety and storability. This upholstery stapler is very inexpensive. It is only compatible with Stanley staples. As the second air staple gun for upholstery in this guide, the Surebonder 9600A has a relatively reliable daily performance. If you need power with user-friendliness, then this may be a good option for your upholstery work. This is a very ergonomic and easy-to-use stapler. The handle is soft and has a good gripping surface and the whole device is very lightweight for extended stapling. It also has a nose extender for adding a bit of reach to your staple jobs. If you don’t apply oil to it from time to time this stapler will simply hiss and not fire. This is also not a very heavy-duty stapler. For folks that want a pneumatic stapler like the professionals use, there is no stapler that is as user-friendly as the Surebonder 9600A. It has power, efficiency, and gets the job done. The stapler’s safety feature won’t let it fire unless there is continuous pressure on the tip. It’s very easy to hook into a compressor. It has a nose extender for smaller areas. It has a powerful operation. Its magazine holds a sizeable amount of staples. It has to be maintained with pneumatic oil. When you need professional-grade performance, the Freeman PFWS is a great option for most jobs. It also uses non-marring tip technology so that despite the pressure that’s being output at the tip, your materials won’t be scratched. This product has some great safety features to ensure secure operation. For safe upholstery work, this stapler will not fire unless the tip is fully in contact with a stable surface. It even has an automatic fire setting to reduce the chance of a repetitive stress injury. Without practice, you may accidentally fire multiple staples at a time. Also, it can sometimes be difficult to find the wire staples that this gun fires. 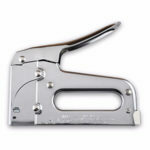 If you have a big upholstery or home improvement project, the Freeman PFWS Professional Wire Stapler is a great option. It even has automatic firing that can save your trigger finger from injury. This is a powerful stapler. It won’t scratch or mar your upholstery materials. It has safety features that won’t let it accidentally fire. It’s only compatible with T50 staples from Arrow. Another fine wire upholstery stapler, the BeA 71/16-401 is a great stapler for overall power. 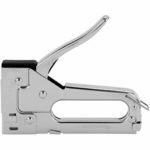 Additionally, its capacity to deliver a steady stream of staples makes this a very efficient and professional-quality stapler. This stapler has a loading feature that makes replacing the staples in the magazine easy. Additionally, the 71/16-401 has a strong and far-reaching nose extension that will let you get good leverage and reach. 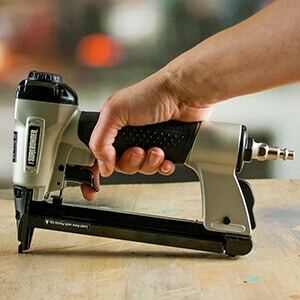 This product has a lot of power; in fact, it might be a little too powerful for home-based upholstery work, but if you want a true professional-grade experience, this is one of the most industrial products in this guide. This heavy duty pneumatic stapler will get the job done quickly and effectively. It has a quick output and can generate a lot of pressure for even and strong stapling. This stapler series is known for its long service life. It accepts several types of wire staples. It has an easy to grip, ergonomic surface. It can have a little too much power for everyday use. It’s a bit heavy for extended stapling. As a manual stapler, the T50VP has the ability to manage heavy duty jobs and takes the same types of staples as the Freeman PFWS. With this selection, you receive a full kit that includes the stapler, a case, a wire attachment, a screen attachment, and a staple lifter. This is a powerful manual stapler that has a good level of usability; in fact, this is a manual stapler that can easily be used in a professional environment. It’s also made to be tough, which means that it will compatible with difficult jobs. As with any manual stapler, using this over the course of the day will be fatiguing. Additionally, this stapler can jam from time to time and can be difficult to unjam. There are few devices more reliable than a manual stapler. While it might take some elbow grease, this T50VP should handle all of what you throw at it. This comes in a fully-packed kit. This is a very durable staple gun. This upholstery staple gun will last for years or even decades. It will staple into dense materials. The case isn’t very strong; it’s only made of plastic. This item is another pneumatic product that has a strong output for tougher materials. Additionally, it has a long nose extender for getting inside cracks and crevasses. This is a very durable stapler that will last for years of use. It’s also very comfortable; its grip is molded rubber that feels comfortable during use. Staple gun also has a simple structure for quick and easy repairs. It even has a silencer under the compressor tube that can cut down on a lot of the loud operation that you find in these products. Unfortunately, this pneumatic upholstery stapler doesn’t have any sort of safety mechanism. Also, this stapler doesn’t have the automatic fire setting that can save your finger from needless repetition. This Meite pneumatic stapler has a good design for most upholstery work. While it lacks a safety mechanism, it has a good overall performance that will last for years. At only 2.4 pounds, this is a lightweight device. It’s longer nose makes it very useful when you need to fit device in places where your hand cannot reach. It has a silencer under the air connector. The first electric stapler in this guide is the Maestri ME 3G, which has fairly good features for the price point. 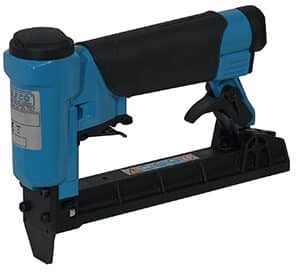 While it doesn’t pack a lot of power, this Maestri staple gun will definitely manage most of the upholstery needs that you throw at it. This product has a very efficient and noise free operation. In fact, you’ll find that there is very minimal recoil when you use the stapler function. It also includes a hard case for transport of the stapler. The chief issue with this stapler is that it’s hard to find replacement parts. In addition to this, it can be somewhat tough to find staples for this device outside of the internet. This is an adequate electric stapler for those who need to execute work quickly without much strain. Simply plug it in and start your stapling work. This product includes a hard case. It can shoot a wide variety of staples. It has a high degree of overall precision. It has adequate power to puncture materials like hardwood. At almost seven pounds, this is a relatively heavy device. It has hard to replace components. While this Fasco stapler isn’t one of the fastest on the market, it does have some relatively quick operation for those looking for a single shot functionality. Simply depress the trigger and your staple will fire deep into your material. The magazine refills from the front of the stapler and can be reloaded quickly and easily. For those that need a little reach, the nose extender has an adequate amount of extension so that you can apply your staples in smaller areas. For some reason, when you start your work, the staple seems to prefer that the magazine is full. If you start with a partially depleted row, the upholstery stapler may misfire a few times. Additionally, the pusher blade has a tendency to jam. Sometimes you need efficiency and this single-shot stapler is one of the more efficient products in this guide. Gun sends out a single staple and plants it firmly in the wood without much struggle. It has a powerful firing mechanism that will deeply embed the staple. It has a high degree of efficiency. Broken rows of staples can cause this product to jam from time to time. 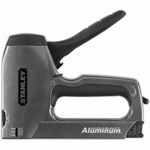 This second Stanley product in this guide is designed to meet a heavy duty workload with relative ease. If you need a bit more pressure than is available in Stanley’s metal upholstery stapler, then this may be optimal for your needs. This device is made from aluminum, which means that it’ll take a few licks and will still hold up to daily wear and tear. Additionally, this is a good device for a toolbelt because staple gun won’t weigh you down as you work. 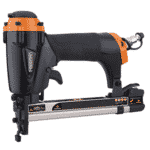 It also can function as a brad nailer or a cable and wire tacker. This isn’t the easiest stapler to load. In fact, it doesn’t come with instructions on how to reinsert and replace the staples. It also has a tendency to misfire from time to time. For a simple manual stapler, there aren’t many products as good for heavy duty applications as the Stanley TR250. It’ll last a while and will let you penetrate hardwoods, flooring, and roofing with ease. It has an all-metal drive channel that adds pressure enough to penetrate most materials. With the extra driving power, there’s less need to squeeze hard. This is a lightweight upholstery stapler. Despite its added power, you will probably still feel fatigue using this stapler. There is no nose extender. 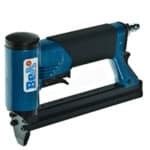 It’s important that when you are seeking the best upholstery stapler for revitalizing your furniture, that you consider a few key points. 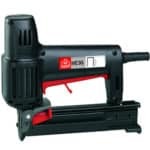 One of the most important features of a good upholstery stapler is stapling power; most good furniture is made of hardwood, so it’s important that you get a clean staple insertion. If you skimp on power, you’ll most likely regret it because you’ll try to staple on some upholstery and you’ll only get partial penetration on your staple. When this happens, you’ll be forced to hammer the staple in the remainder of the way, which is more effort than you should need. This is why spending a few extra dollars for a quality stapler is preferred if you intend on doing meaningful upholstery work on hardwood furniture. Upholstery staplers use that tried and true technology that many associates with office work: the staple. 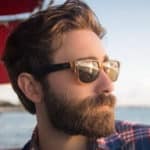 While upholstery staples have a similar visual appearance to office staples, you’ll find that these items are much sturdier and can pierce the strongest materials. This is why good pneumatic staplers are used in siding, roofing, tough leather, and of course, upholstery. These staples can penetrate deeply into materials like hardwood and are much faster to deploy into the heavy material than most screws or nails. Additionally, these grip tightly and have a very small profile, whereas a screw isn’t the most attractive object to find in your furniture. Additionally, using these upholstery staplers can really grant a tight fit. When you are reupholstering a piece of furniture, simply stapling it in at the base can be done really quickly and those staples won’t come out of the hardwood base for years or decades. Manual – We’ve all seen these types. With the manual upholstery stapler, physical force is needed to drive the staple into the material. This means that you’ll have to press down an actuation lever in order to fire the staple out of the appliance. 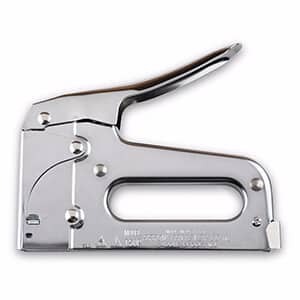 The primary draw of this type of staple gun is that it is 100 percent portable. You’ll need no power source or compressor with this; you simply use your muscles to provide the power for the manual stapler. Unfortunately, this can get a bit tiring on your hands after repeated staples. This is the most affordable option of the three types. Electric – An electric stapler doesn’t require much in the way of arm strength; it simply uses a motor to drive the staple home. These are oftentimes used by professionals because they offer a good amount of power with less fatigue than a manual upholstery staple gun. The chief issue with these is that, For the most part, they require wiring, which can be cumbersome. Additionally, for the wireless models, you may not have as much power and you also may not have enough charge time for big jobs. For a medium level of affordability, the electric stapler works well. 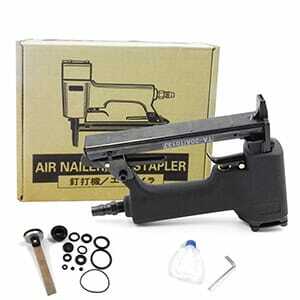 Pneumatic – The pneumatic upholstery stapler is actually the version most commonly used by professionals. As a result of their relatively complex designs, these are also typically the most expensive of the three types of upholstery staplers. These staplers really come out ahead of the other two in terms of raw power, which is why they are great for big jobs. The main issue with these is that a pneumatic stapler requires a compressor, which is another expenditure. Also, the compressor tends to be loud and will tether you to a small area for work. Despite these gripes, nothing beats a pneumatic for quickly getting the job done. Trigger Finger – We’re not talking about the itchy kind. Trigger finger is simply the name for a repetitive stress injury that can cause you to feel pain in your forefinger as a result of constant, repetitive trigger-pulling. In fact, trigger finger can cause the tendon in the finger to lock up painfully. The best way to prevent this potential and painful condition is to utilize a stapler with a mode that will let you send several staples out with a single trigger pull. These can help prevent trigger finger and save you from needless pain. Magazine Length – This is a major convenience consideration. The magazine of your stapler is where the staples are held; and the longer the magazine, the more stapling you can do without replacement. If you have a larger re-upholstery project, seek out a stapler that has a larger magazine so that you can have reduced downtime during your project. Nose Extensions – During some projects, you might find yourself faced with a stapling job in a hard-to-reach area. In this situation, it’s advantageous to seek out a product with a nose extension. These extensions will let you apply staples in areas where you might not be able to reach your hands. 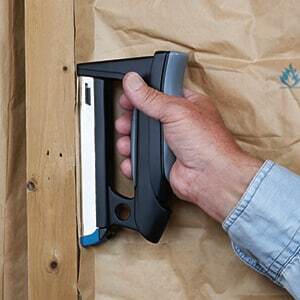 Upholstery staplers make fixing your furniture a cinch. All of the products that have been covered in this guide are perfect for repairing missing upholstery staples and many can be used to upholster your furniture as well. In the future, there is a talk of semi-robotic upholsterers that will be able to install your staples with ease and with perfect spacing. Until then, the products on this list will deliver years of satisfaction. 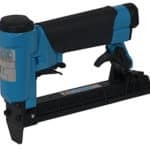 We tested more than 20 brands to choose 10 best staple guns for upholstery in 2019. Manual, electric or air-powered for home use and professionals.